Missing files can compromise your WordPress! website so it's essential that you have them all. RSFirewall! scans all your WordPress! files for changes. To trigger this functionality, head to RSFirewall! > System Check and perform the System Check. RSFirewall! 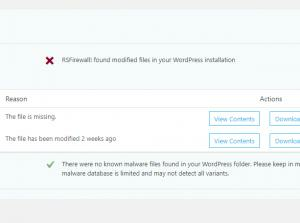 will notify you if any of your installation's files do not exist. You have the option to ignore these notifications by clicking on Accept changes for the selected files, thus rendering the component to skip those files on future system checks. Ignoring certain files can be useful, as many WordPress! users choose to remove files that are not necessary (like the default WordPress! templates, for example) in order to reduce the storing space on the hosting provider's server or to simply discard any unnecessary additions. You can read more about this feature in our documentation. Note: If, however, you have not deleted the missing files yourself, this most likely means that your website was hacked.